For any speedy readers who have already finished reading The Quiet at the End of the World, I’ve posted a deleted scene where Lowrie and Shen steal an antique carriage and Childhood Sweethearts – a 6000 word fake dating AU short story. My first Writers HQ retreat is next Saturday in Coventry! Come along if you have a book/dissertation/proposal to get WRITTEN. Another teaching announcement after my Uni of Cambridge day course. I’m teaming up with Write Mentor to run a writing course this September. This entry was posted in the quiet at the end of the world on 16/03/2019 by Lauren James. Popping in for a quick announcement! I’m going to be teaching a day course at University of Cambridge this November called ‘Write the one percent: creating diverse, inclusive fiction’. More info here. If you work in a UK state school you can get a 50% bursary on the tuition fee! During the course of this day-school, we’ll explore the key concepts of diversity in writing and consider why it’s important for writers of all kinds to make their work inclusive. We’ll define some of the most under-represented identities and uncover the common pitfalls in writing about them. How can we avoid stereotypes and inaccurate representation? Thoroughly researching an identity before writing is key, and together we’ll look at how to do that. Through a creative writing exercise, you’ll come to realise to what extent a new perspective and identity can bring real depth and richness to your writing. Also, The Quiet at the End of the World was in this week’s Waterstones Weekly newsletter, which I was DELIGHTED by! And for any speedy readers who have already finished reading The Quiet at the End of the World, I just posted a deleted scene where Lowrie and Shen steal an antique carriage. This entry was posted in Uncategorized on 13/03/2019 by Lauren James. I love giving book recommendations! Over the course of writing a book, I will update my goodreads shelves whenever I have an ‘aha!’ moment, where I realise where I’m getting my inspiration from (put in a different way: where I’m stealing the best bits from). I find it really fascinating to see how my brain processes the things I’ve read and watched and spits them out as something new. Here are some of the things that went into The Quiet at the End of the World – and here’s the goodreads shelf, if you want to see the rest. This is – well, it’s a science fiction and fantasy series set in a world where extinction events destroy civilisation every hundred years, the survivors have to try and relearn how to create a society from the remains of cultures that surround them. This is exactly my sort of thing – archaeology as a means of survival. It’s about legend and science, and how to work out which is which. It’s about found families and slave races and something like magic. It uses archaeology in a very different way from The Quiet at the End of the World, but it will make you really think just as much. It’s diverse and full of plot twists and changes in perspective and the most wonderful characters. But what makes this series really special is that it uses the writing in a completely different way from anything I’ve ever seen. It’s a masterclass in originality. I read this while I was writing The Quiet at the End of the World, and it was like Elizabeth Wein had reached inside my brain and found the perfect book I needed to read at that point in my writing life. I’m a huge fan of thirties detective novels like Agatha Christie and Dorothy L Sayers, and this is my perfect spin on that – there’s murder, rich people living frivolously, dogs, Bronze age marine archaeology, castles, cross-dressing Cabaret shows, TREASURE-HUNTING, pearls, buried treasure (did I mention the treasure? ), river trawling and Harriet Vane mentions. I’m so into it in every way. This is a non fiction biography of a man’s determination to track where some of his family’s old antiques came from, and the stories behind them. It goes from Japan to Nazi-occupied Vienna, back to Japan, and then London. It’s a great look at the history each object holds, and it’s one of the reasons why I wanted to write about treasure-hunters, searching for lost objects. No spoilers, but this book inspired a pivotal moment of The Quiet at the End of the World. It’s also just a fascinating read, and tells you a lot about the human mind, and how little it has changed in hundreds of thousands of years. I don’t agree with several of the interpretations of what objects were used for (I don’t really think we can ever understand the thinking behind objects – someone might discover an old iPad and see nothing more than a fancy tablemat – so I recommend reading with an open mind. I read Station Eleven a few years ago, and really came away from that novel with a sense of just how much there still is to live for when you’ve lost everything. As a reader I feel like there are so many stories that hadn’t been told in that kind of setting – after the angst of the apocalypse, when you’re not necessarily trying to rebuild the world but live a good, happy life in the time you have left. So as a writer, I didn’t want to write a dystopia full of villains and evil governments (there’s enough of that in real life). I just wanted to write about humanity in isolation. The Quiet the End of the World was my response to this book. This is another post-apocalyptic novel set in England, that does something very, very different from what you expect when you hear those words. It’s unique, heart-breaking, and will definitely change your opinion on sci-fi as a genre. A girl in a huge underground library explores its thousand year old depths with her magic dog sidekick. Every delicious trope rolled into one – and no romance! The Quiet at the End of the World took the libraries, the dogs and the tunnels underground – but left the magic. Sorry! The original ‘what would happen if humans stopped having babies’ book. I watched the film (which is very different from the book, and highly recommended) over and over again when I was growing up. My take on this question is almost the exact opposite of Children of Men – which says that, society will go to crap. In The Quiet at the End of the World, the opposite happens. This entry was posted in book recommendations, the quiet at the end of the world on 11/03/2019 by Lauren James. When The Next Together and The Last Beginning were released, I posted the different versions of a scene in the book as it went through editing from first draft to final published book. You can read The Next Together’s here, and The Last Beginning here. I thought I’d do it again for The Quiet at the End of the World, with a scene from near the start of the book. I’ve chosen a scene from the start of the book, where Lowrie and Shen watch a helicopter crash into Big Ben. You can read the full first chapter with this scene here on Wattpad. Overhead, a helicopter thrums as it heads downriver. It must be Alexei Wyatt, on his way back from one of the abandoned cities around England, where he goes to pick up scavenged items in an old army helicopter. I realise there’s something wrong with the helicopter. It’s tilted at an angle, skittering in the sky like a glass about to fall off a table. It looks like it’s been caught in a gust of wind – but the air is still and calm. “That doesn’t look —” Shen begins, but before he can finish, the helicopter drops out of the sky. The tail rotor catches on a lamppost on Westminster Bridge, and there’s a shrieking explosion of metal. I take an involuntary step backwards as the helicopter whirls in a tight circle, swung around by the force of its spinning rotors. It’s thrown across the bridge and into a support beam. Sheets of metal pull away from the cockpit, and I think that surely it can’t keep going, that it must come to a stop soon, but it doesn’t. It swings around in another violent arc and collides with the clock tower of Big Ben. I can’t believe what I’m seeing. The clock tower explodes, the whole front panel sheering off. The ancient clock face crumples as a rotor blade stabs into it. Bricks fly towards us, and we both scramble backwards through the mud, away from the explosion. Shen’s hand wraps around my elbow. “Run,” he says, and I don’t argue. He’s always so calm in a crisis, but my heart feels like it’s going to hammer out of my chest. I’m desperate to look back over my shoulder at the rolling fireball, but I know I’ll trip and fall immediately if I do. Something lunges towards me and I stumble back in shock, tripping and scraping my knee on the ground. It’s Mitch. Spindly metal legs have sprouted out of the robot’s rusted spherical body, and he’s bounding along the sand towards us. He scoops Shen and me into his arms, and then start hopping in long, jolting strides away from the explosion. I give a little cry of surprise, confused until I realise that his lifeguarding protocol must have been activated by the crash. I’m strangely glad about it, and I hold on tightly. He’s running faster than I could have done. When I risk a glance over the robot’s shoulder, I see that the fire is spreading from the tower to engulf the Palace of Westminster, filling the air with the crack and roar of brickwork collapsing. I can’t think. My mind is abuzz with the white noise of shock – that a helicopter crashed in Central London; that it crashed into Big Ben; that we were right there to see it happen. Mitch releases us, lowering us carefully to the tarmac. “I can’t believe–” Shen says, staring at Mitch and then at the fire. “Tamade!” He always reverts to Chinese when he gets upset. “I know.” My lungs can’t seem to remember how to pull in air. I focus on breathing until my chest loosens and the dizziness stops. “It’s Alexei, isn’t it?” Shen asks quietly. He closes his eyes briefly, grimacing. Alexei, our friend. Alexei, who gave Shen and I the best tips for mudlarking, from his scavenging experience. Alexei, whose wife died a few years ago. Alexei Wyatt, who we’ve known our whole lives. “Do you think he’s…?” I can’t even stand to think about what must have happened to him, in that kind of explosion. A squadron of emergency response drones is already flying to the building, but they look miniscule next to the growing fire. I can’t see how they’ll manage to put it out. Shen takes a deep breath, and there’s only the slightest wobble in his voice when he speaks. “Are you hurt?” He braces his palms on either side of my neck, checking my eyes for pupil dilation. All the colour has disappeared from his face except for an irritated patch of pink at the corner of his jaw, where he must have hit the ground. I rub away the small curls of white that it scraped from the skin. His stubble catches on my thumb. Behind us, the fire is blazing higher and hotter, but to my surprise, half of the emergency drones are flying straight past the crash and heading towards us. “Are they —?” I ask. I let out a heavy sigh. We’re fine. We’re not even hurt. This isn’t necessary. They should all be trying to help Alexei. The emergency response drones swoop in to land, surrounding us in a neat circle. Their laser scanners flicker down our bodies, searching for injuries. “We’re OK,” Shen says, but the drones don’t listen. They chitter to each other in binary as they cluster around my leg, where there’s a tear in the wetsuit. It must have happened when I fell. I can’t feel the cut, but red blood shines bright against the fabric. “Shouldn’t you be putting out the fire?” I ask. It’s hardly a life-threatening injury. I’m worried the same can’t be said of Alexei. The final version sets up a lot of action. It establishes the characters – Lowrie, Shen, Mitch – and their relationships to each other. There’s a hint of physical connection between Lowrie and Shen; a confused lack of knowledge of Mitch, the robot’s, actions. There’s also the shock of a helicopter crash – and the fact that they know who must be in it, because there are so few people. Also, the fact that the bots fly to help Lowrie and Shen instead of Alexei. So, let’s see how much of that I managed in the first draft. Here’s the scene from the first draft, which was called Who Remains (a pun on ‘human remains’. I’ve bolded the sentences which made it into the final book. Overhead, a helicopter thrums as it heads downriver. I become aware that something’s wrong with the helicopter overhead. It’s tilted at an angle, skittering in the sky like a glass about to fall off a table. It looks like it’s been caught in a gust of wind – but the air is still and calm. I watch it. The helicopter is twisting dangerously close to Westminster Bridge. “That doesn’t look-” Shen begins, but before he can finish, the tail rotor catches on a lamppost, breaking off with a shrieking explosion of metal. His hand comes out to me as I take an involuntary step backwards, even though we’re far enough away to be out of danger. The helicopter starts whirling in a tight circle, swung around by the force of its spinning rotors. It’s thrown across the bridge, tearing a gauge in the tarmac as it goes. Sheets of metal pull away from the cockpit, and I think that surely it can’t keep going, that it must come to a stop soon, but it doesn’t. It swings around in another violent arc and collides with the side of Big Ben. The clock tower explodes, the whole front panel sheering off in the helicopter’s path. The ancient clock face crumples as a rotor blade stabs into it. Bricks fly towards us, and we both scramble backwards through the mud, away from the explosion. Shen’s hand wraps around my elbow, pulling me to my feet. “Run,” he says, and I don’t argue. His voice is calm. He’s always so calm in a crisis. I’m desperate to look back over my shoulder at the rolling fire ball, but I know I’ll trip and fall immediately if I do. The rocks and debris move under our feet, but somehow, we both keep our balance. I can hear the crack and roar of brickwork collapsing, even from here. When I risk a glance, the fire is spreading from the tower to engulf the Palace of Westminster. We climb the staircase embedded in the concrete embankment, two steps at a time. My calves are screaming by the time we reach the pavement. I turn to watch the fire spreading, leaning on the wrought iron railing. “Did you recognise the helicopter?” I ask quietly. We know almost everyone with a helicopter in London. We know everyone in London, full stop. I wonder if there’s even a chance that the pilot survived. A squadron of emergency response drones appears, flying to the building to fight the growing flames. I strain my eyes, trying to make out the path we took along the riverbank, to see how close we were when the explosion hit. The tide has sunk our footprints back into nothing. To my surprise, the drones fly straight past the crash and head towards us. I let out a heavy sigh. We’re fine. We’re not even hurt. This isn’t necessary. The emergency response drones swoop in to land, surrounding us in a neat circle. Their laser scanners flicker down our bodies, searching for injuries. “We’re okay,” Shen says, but the drones don’t listen. They surge in on my leg, chittering to each other in binary, and I realise there’s a tear in the wetsuit and my leg has been cut. It must have happened when I fell. I can’t feel it, but the red shines bright against the fabric. A mechanical arm appears from one drone, reaching out to clean the shallow wound. “Shouldn’t you be putting out the fire?” I ask, pushing away the arm. It’s hardly life-threatening. I gesture towards Big Ben, which is leaning dangerously to the side, flames curling up its length. So, as you can see, a lot of the original phrasing stayed the same. But there are a lot of changes going on in the background. Mitch didn’t even appear in the first scene – his introduction used to happen later on, and it was a lot less dramatic and memorable. In the first draft, there’s also not much concern for the person flying the helicopter – Lowrie is more worried about Big Ben. They don’t know who might have been inside, which implies the population of London is a lot larger than the small community of the final draft, where they know immediately who it must be. The nice moment of concern between Lowrie and Shen where she rubs his jaw isn’t here yet, either. So, how did we get from start to end, here? That’s all down to the power of my editor. Here’s the suggestions she made to the scene. Most of them were accepted, but not all of them. Some minor things changed here which aren’t included – Mitch went from they/them to he/him, Martin changed to Alexei. Hopefully this was interesting, if you’re a writer! This entry was posted in the quiet at the end of the world, writing posts on 09/03/2019 by Lauren James. It was so, so much fun, and I can’t think of a better way to bring this book into the world. You can watch 27 minutes of the panel here. Q&A with Fantastic Books – who also made this amazing moodboard! As a science student, it’s always been rare for me to find fictional scientists who feel realistic. Most of the time the scientists I see in films are wildly absurd – geniuses in not just their field but in everything, who know how to hack any server, recreate any molecule, identify any liquid and calculate the angle of impact of any bomb. Frankly, this isn’t great. In a time when women still only make up 23% of the STEM (science, technology, engineering and maths) workforce, there need to be better role models for the aspiring girls in the audience. There are a few places you can win a copy of the book – on Lucy Powrie’s twitter, on Melinda Salisbury’s, and by entering #TheQuietBookChallenge on instagram (which gets you a subscription to Illumicrate and more). If you get it, I hope you like it! I am very nervous! Lowrie and Shen are the youngest people on the planet after a virus caused global infertility. Closeted in a pocket of London and doted upon by a small, ageing community, the pair spend their days mudlarking and looking for treasure – until a secret is uncovered that threatens their entire existence. This entry was posted in the quiet at the end of the world on 08/03/2019 by Lauren James. The Quiet at the End of the World features two characters who study STEM, just like my other books (I have a niche, and it is intensely nerdy characters). 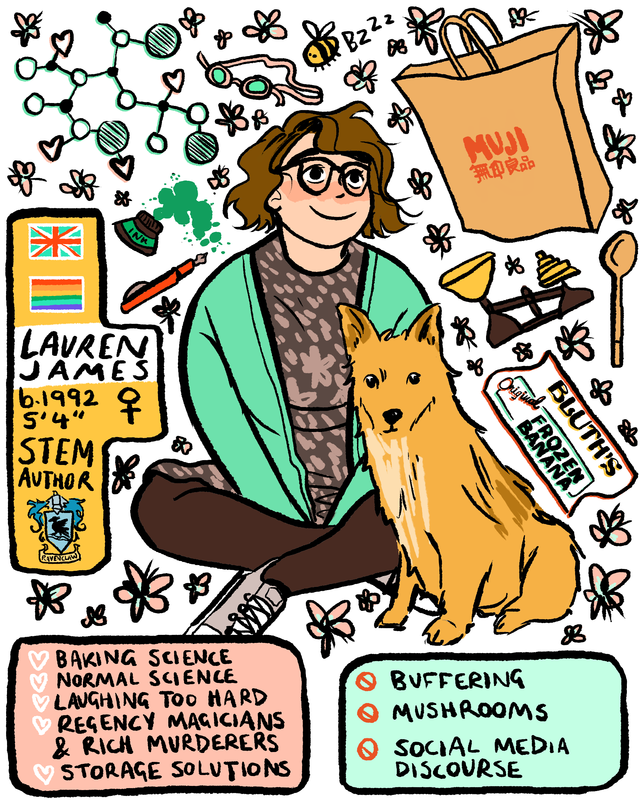 This time, Lowrie, the protagonist, is an engineer and her best friend-slash-lifelong-crush Shen studies evolutionary biology. They are also both archaeologists, but they would never call themselves that. Lowrie has her own workshop full of tools and carries a supply around with her just in case there’s anything that needs fixing and/or breaking open. Shen has a permanent stack of books he wants to read, full of information he hopes will help him understand the crumbling civilisation around them. He’s not so great at the physical side of things, but he has Lowrie for that. She and Shen are the perfect team – skills and smarts, they call it. Read the rest at Sunday YA! This entry was posted in the quiet at the end of the world, Uncategorized on 03/03/2019 by Lauren James.